Exposures to volatile nitrosamines were measured at 24 rubber manufacturing plants from 1992 to 1995. 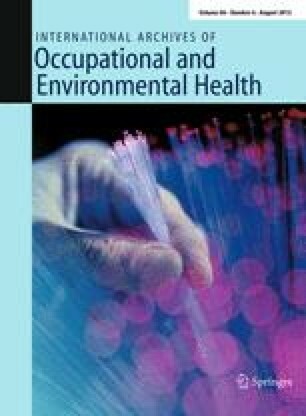 A total of 709 exposure measurements were taken in general areas or personal breathing zones to estimate exposure according to production types (seals, joints, tyres, gloves, etc.) and production steps, from mixing to storage. Five different nitrosamines were identified. N-Nitrosodimethylamine is the most frequently encountered nitrosamine and represents the most important fraction of the total nitrosamine concentration measured in a given sample. This fact is consistent with the use of rubber additives containing corresponding amine precursors. One hundred and forty-one of the 709 values exceeded the German target value (TRK) of 2.5 μg/m3 for all nitrosamines present from rubber vulcanisation, the only available standard for occupational nitrosamine exposures. The salt bath curing process generates particularly high nitrosamine levels, 90% of the 96 measurements being over the TRK, with many values exceeding 20 μg/m3. The reasons why the TRK is exceeded are generally well identified. To reduce nitrosamine emission levels it would be advisable to eliminate nitrogen oxide sources, principally by using a process other than salt bath curing, and to develop different rubber stocks that do not contain secondary aliphatic amine functional groups (“safe amines”).